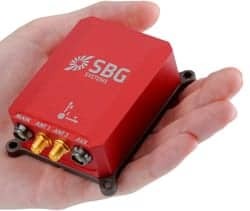 SBG Systems has confirmed that the Ellipse2-D inertial navigation sensor has been successfully integrated into BoE Systems’ ELV16 Scanner, a compact UAV-based LiDAR solution designed for the mobile mapping industry. The ELV16 Scanner is also equipped with a Velodyne LiDAR sensor. The ELV16 Scanner can be securely mounted to a DJI Matrice 600 Pro UAV for simple, safe, and effective operation. The scanner is remotely operated through a simple user-friendly interface, and features a robust suite of continuous monitoring capabilities allowing the operator to control and monitor the streaming data acquisition from start to finish. “You can start your data acquisition at take-off, or you can start the data collection when the UAV is right on top of the specific zone to survey, and then stop it whenever you want” declares Jason Littrell, founder of BoE Systems. The Ellipse2-D is a Dual Antenna Inertial Navigation System which embeds an RTK GNSS receiver with post-processing capabilities. It is widely used in the mobile mapping industry as it combines accuracy with low weight, at a competitive price point. The Ellipse2-D provides roll, pitch, GNSS-based heading and centimeter-level position. 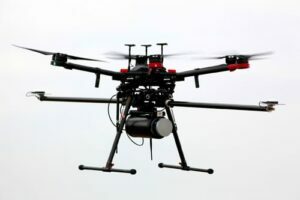 It is used to compensate for the UAV motion, and thus to orient and geo-reference the point cloud generated by the LiDAR sensor. GNSS-based heading makes it immune to magnetic field, so the UAV can get close to power lines without disturbance. “We heard some good reviews about SBG sensors being used in the surveying industry, so we conducted some tests with the Ellipse2-D and the results were exactly what we needed” concludes Jason.